Important WordPress Plugins: Hello Friend's In today's article, we will learn about Important WordPress Plugins, which you can use to make your Blogging even more useful and easy. Plugins are a feature provided by WordPress that you can easily do any thing on your blog. Today there are so many plugins on WordPress that for almost any work you get 8-10 Plugins. Now if you are a new blogger then you will know that you can benefit from adding the features to your blog. 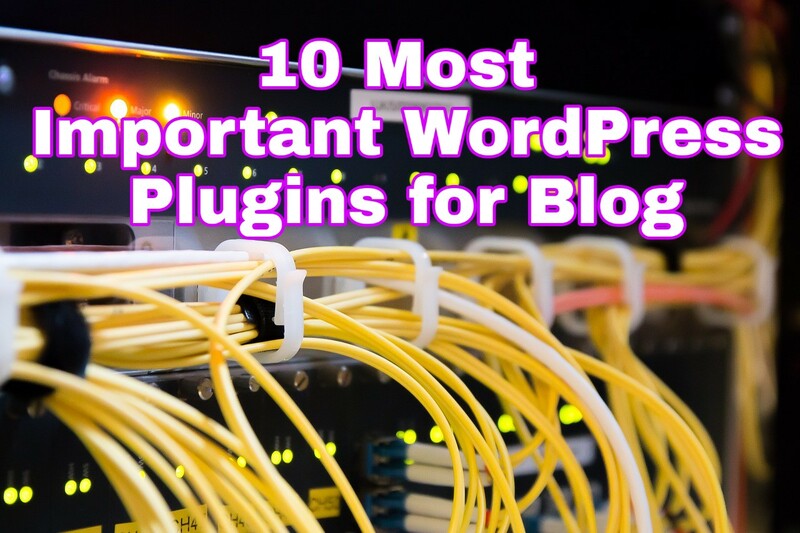 That's why we are telling you about 10 Important WordPress Plugins that you can use to save your blog and also make your blogging even better. It is important to check traffic on the website but it is more important to know which section of your website is having the maximum traffic increase, because then you can make your blog more popular by creating multiple articles on that topic. Are there. For Example: When you create a blog, you publish articles on different Topics on that blog, but there are more traffic on some of those articles. This shows that people like to read your content on your blog and you can take advantage of that. This plugin gives you a lot of help in increasing traffic on your website. Because One Signal Push Notification Plugin shows in your blog like a popup and users can not allow that notification. So whenever you publish an article on your blog, your Readers have a Notification Show on the browser and click on that Blog on that Notification on your blog. Which makes Traffic Increase a lot more on your Latest Articles. Along with this, the Wordpress Security Plugin also provides some other features like downloading a website's backup etc. This Plugin gives you a lot of help in making On Page SEO on the website. Through this Plugin, you can easily Analyze the Density of any Keyword on your blog by that Mistake Keyword Density is not too much on your article, because this does not crawl your article on Search Engine. Along with this it helps you to complete Complete On Page SEO on your article and also helps you to increase Readability. So that your readers can easily read and understand your article. All of them say that WordPress is more than Blogger's Best Blogging Platform because here you find everything you need easily. WP Edit Provides almost all of the things you may need when writing articles. Jetpack Plugin is used to check Traffic Details on your blog so that you can remove Traffic Details on your website, and by using this plugin, you can also share articles on your blog on Direct Social Media Account. Can. WP Smush Plugin compresses the uploading image to WordPress Blog without damaging the quality of that image. When we compress the image with the help of a tool, the size of our image is Reduce and the quality of the image is any It does not matter but when we do this with all our articles, we have to spend a little more time on our image. In this case, you can save your time just by installing WP Smush Plugin on your WordPress Blog and keep your Blog's Loading Speed ​​compressed by compressing the images that are uploaded to your blog.